sequence that they have been written as they tend to build on each other. This is the 4th book I have read from Carmon and I have greatly enjoyed all of them. In this book, the main character Dan Gordon goes undercover to infiltrate and destroy an international Hezbollah funding plot. But when his cover is blown he wonders if he-s been a sacrificial lamb for the CIA all along. The book takes you to Paraguay, Sierra Leone, Lebanon, Italy, and Romania. It is fast paced and a great read. I agree. 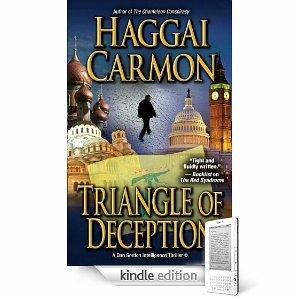 I became a fan of Carmon’s thrillers ever since I read his first thriller Triple Identity. I love the authenticity of his plots. Anyone knows when the next thriller will appear? And where is Hollywood? Are you guys asleep, or what?